Thoughts on Martini serving glassware. Or When is a Martini Stem not a martini Stem? That is my Martini on my most recent visit to Moshulu! First let me explain a bit about Moshulu. She is a four-masted steel barque built in Scotland in 1904 and is the largest remaining original “windjammer”. Her first runs were shipping grain from Spain to Australia and back. Later, between 1904 and 1914, she shipped coal from Wales to South America, nitrate from Chile to Germany, coal from Australia to Chile, and coke and patent fuel from Germany to Santa Rosalía, Mexico. But now she is a floating restaurant docked in Penn’s Landing, Philadelphia. And a very good restaurant! The decor is classic nautical. Well, really, what else would you expect! There are two ‘floors’ available; the interior main deck with a dining rooms and bar/lounge and the upper, open air though covered, dining area. Above this is another bar. The views of the Delaware river, and New Jersey on the opposite shore, are wonderful from almost anywhere on the boat. Only the tables on the Philadelphia side miss this view. I’ve eaten here several times over the years and I’m never disappointed. Whether inside, outside, or at the top bar the experience is wonderful. It is absolutely a great place for a romantic dinner and drinks. Especially when the weather allows sitting up on the deck. Well after an excellent dinner I headed up to the top level bar to witness directly how they made the martini and have a talk with the barkeep. It turns out that the bar purposely used the brandy stem for all Martinis ‘upstairs’. Or more specifically ‘in the wind’! Since this bar is open air and a bit above ground level, its gets a bit breezy. They have had the unnerving experience of seeing their Martinis served in martini stems being blown over on several occasions. Turns out that the brandy stem is much more stable in the wind than the martini stem. As the barkeep advised, “You can have the Martini in the brandy or in your lap”. Given that choice I chose to enjoy the Martini in the snifter. As for a Martini Rating, Moshulu gets one stem. Their Martinis are very good, they’re just not quite good enough to warrant a trip based on their Martini alone. However I would highly recommend the restaurant as a whole and am looking forward to returning. For Gin Selection Watermark gets a TBD. Unfortunately I didn’t get the details of their entire gin selection. I know they have the ‘Big 5’: Bombay, Bombay Sapphire, Tanqueray , Tanqueray Ten, Hendricks. There is also Nolet’s and, being located in Philadelphia, they have Bluecoat. But I believe there are other selections. Fortunately this just gives me an excuse to go back and do a bit more research. An interesting side note; in the top photo, that blurry grey thing in the upper background is the retired battleship USS New Jersey. Do you have a preference on stemware? Perhaps you haven’t thought too much about it. Many people’s only desire is a clean stem for their drink. That’s clearly a good start. 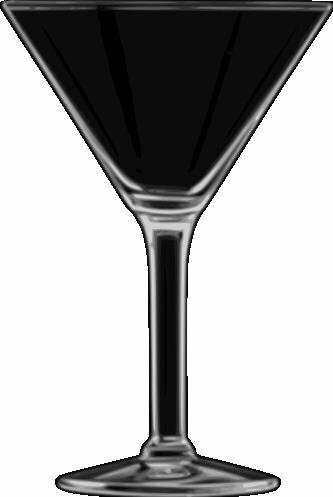 I do have a preference; I want my Martini in a stem with some heft, some weight, and some significant mass to it. No, not because I’m working my biceps and delts. Because of thermal mass. You may be asking yourself “What is this guy babbling about”. This may take a bit so bear with me. Or skip this and move on if you’d like. As I mentioned before, my Perfect Martin is ice cold. Ideally it stays ice cold for the duration of my enjoyment. But we all know that the drink will warm up over time. I want to maximize the time my drink stays cold. The more thermal mass in the glass, the longer it will take to warm up. Sadly most bars use thin, light weight, and cheap stemware. I understand that they’re running a business and stemware is, unfortunately, disposable. It breaks constantly and has to be replaced regularly. But that frilly little bit of glass warms up just too quickly. That’s why I want a stem with some heft. I want a long lasting cold Martini.